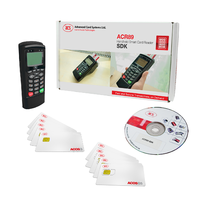 The ACR89U-A2 Handheld Smart Card Reader with NFC tag support provides a secure and cost-effective solution for implementing smart card applications. It may be used to access contact and contactless cards following the ISO 7816 and ISO 14443 standards. This portable, dual interface PIN-pad reader with contactless card reader module runs a 32bit-MCU. It also has a built-in keypad, 128×64 LCD, LED indicators, buzzer, dual full-sized contact card slots, and 3 SAM slots. Furthermore, it comes with a USB cable for its PC-linked mode, and Lithium-ion battery for its Standalone mode.